Inside the paint, Erin Nyhus slips between double coverage for the jumper. 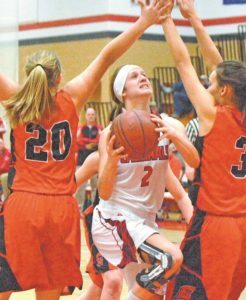 The Brodhead Cardinals (8-10 overall, 5-9 Rock Valley) dropped a tough 54-52 Rock Valley decision to Edgerton last Friday. The Cardinals used a 7-0 run to take a 9-2 lead early. Senior Brooke Bescup finished on the block and junior Alexis Oliver slipped to the basket for an uncontested lay-in. The Cardinals got high percentage looks in the opening seven minutes.